Jumpstart’s Fall Luncheon shines a spotlight on the importance of school readiness and helps to raise funds to support Jumpstart’s work to close the educational opportunity gap for young learners. The 2018 Fall Luncheon in New York will take place on November 13 and feature a diverse, all-female Writers Panel of award-winning and bestselling authors, including Dale Atkins, a member of the Jumpstart National Early Education Council, and Amanda Salzhauer, co-authors of The Kindness Advantage. Atkins is the author of six books and has been called “our favorite psychologist” by TODAY show host Kathie Lee Gifford. Salzhauer currently serves on various nonprofit boards in the New York area, including serving as president of the board of directors for the Riverdale Neighborhood House. 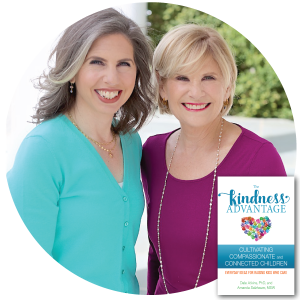 In today’s blog, we speak with Atkins and Salzhauer about the power of kindness and the inspiration for their book. What was the inspiration for this co-authored book? Dale and Amanda: Our original plan was to write a book about teaching children how to be charitable and compassionate. It’s a topic we heard others discussing and Dale had been asked about often. As we began the process, which included interviews with people we viewed as very charitable, our focus shifted. We realized that most of the people we were interviewing shared several characteristics — acceptance, empathy, commitment, and others — which comprise the fundamentals of kindness we write about. What we realized was that rather than helping parents teach their children how to be charitable and kind, our focus should really be on giving them tools to nurture those qualities that are already within their children. How did you decide to collaborate? Dale and Amanda: Ten years ago, after Dale published Sanity Savers: Tips for Women to Live a Balanced Life, the recession of 2007-2008 was having its effects. Over the next few years, Dale spoke in the media and to groups across the country about raising financially-responsible, charitable children and she began to think about writing a book. Dale thought it would be a good idea to interview people who she knew to be raising very charitable children. Amanda was one of those people! Amanda had three young daughters, was living a charitable and connected life within her family, and was always involved behind the scenes. Her daughters were encouraged to work in the garden and “serve” in some way — whether in their everyday lives at home, as mentors in their schools or communities, or in their own or friends’ projects. We spoke further about the idea of the book and decided to write it together. Jumpstart is working to level the playing field for all children. How does The Kindness Advantage speak to this need in education? Dale and Amanda: Kindness is something that anyone — of any age, of any socioeconomic, religious, or ethnic background — can practice. Research has shown us that babies as young as three months old show a preference for helping behaviors over hindering behaviors. Toddlers under two years old show greater happiness when they give treats to others rather than receive treats themselves. These behaviors are what we want to encourage in our children. We are hard-wired for kindness. It is vital for parents, grandparents, and teachers to nurture those tendencies. By giving kids opportunities to practice kindness and valuing kindness when we see it exhibited, all kids have the chance to develop this essential characteristic. Not only will kids feel good about themselves when practicing kindness, but our homes, schools, and communities will be happier and more harmonious. Dale: I think of myself as a psychologist who writes. I have a hard time thinking of myself as a writer, so I think of myself as an author. As a child I wrote in a diary and always loved to write letters. Dale: Having an idea, letting it simmer, and then finally wading through the several incarnations to get at the heart of what I am trying to say. Amanda: One of the things we have done to reach a broader audience is write guest blog posts for other people’s blogs. I had never written a blog post before and found that it is a style of writing I really like — I think I do well distilling large quantities of material into shorter, more accessible pieces. What advice would you give a young writer struggling to find their way with words? Dale: Keep reading and tell stories about what interests you. Use your imagination! Amanda: One of the other things I learned while writing this book is that much of what we wrote early on did not end up in the final version. The reason I say that is because I think it is important to let go of any preconceived ideas about what your writing “should” be and just get the words on the page. You may find that things evolve in a way that you could not have predicted. The only way to find out is by writing more. At Jumpstart, storybooks offer a way to connect with preschoolers and to build their language and literacy skills, helping prepare them for kindergarten. Did you like to read as a child? What was your favorite book? Dale: I liked to read and loved storybooks. I remember reading Aesop’s Fables and Grimm’s Fairy Tales before going to sleep (now that I think about that, I wonder how I got ANY sleep!). As I got older, I enjoyed reading about children in far away places and about animals — Black Beauty, Bambi, Peter Pan, Heidi, Swiss Family Robinson. I also loved reading biographies. I was very influenced by The Diary of a Young Girl (the diary of Anne Frank), which I read when I was eight or nine. Amanda: I loved to read as a child, and still do. My favorite picture books were Alexander and the Terrible, Horrible, No Good, Very Bad Day (because some days are just like that! ), the George and Martha series, and Harry The Dirty Dog. I loved revisiting these books with my own kids when they were little as well as discovering some new favorites. We can’t wait for you to meet Dale and Amanda on November 13 at the Fall Luncheon! Click here for tickets and more information.